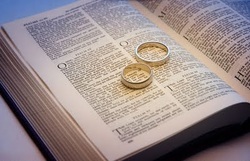 Celebrate your marriage and look forward to many more years together with a renewal of your vows! No need to worry about organizing for weeks (or months!) ahead of time like when you were first married. No need to save for months on end! We are going to make this meaningful date night easy for you. Let us do the work! Please join us ... and tell your friends! The event will be complete in one hour giving you plenty of time to get out and enjoy the rest of your Valentine’s Day. Solution FM and our sister station, WHCF, will host the event and Pastor Tom Obey will preside over the renewing of the vows and challenge you to connect deeper in your marriage . Always Creative Catering will provide the light refreshments and appetizers. Guests are welcome. Beal Family Photography will be taking pictures of each couple. They will provide a digitally edited photo online and a free 5x7 per couple, with the option of more being purchased. Cost is just $5 per couple, and you are asked to pre-register here or by calling 207-947-2751. To see a video recap of last year's event click here.